We hope to get to our post of the Mirrodin Besieged Pre-Release we took in at OMG Games yesterday (Sunday) perhaps tomorrow. We did show up on Saturday around 10 minutes after registration opened and they had already filled their capacity of 64 players - one of the best turn-outs we can remember. Sunday was a solid showing as well with around 24 players but we failed rather miserably with building our sealed pooled which resulted in a draw, loss and loss before dropping to go home and admire our new card goodness. Late last week, Wizards posted their sales solicitation flyer for the third set in the Scars of Mirrodin block, code-named 'Action' scheduled to be released May 13, 2011. Action will be properly named 'Mirrodin Pure' or 'New Phyrexia' and will only be revealed at the last moment and will reveal whether the Mirrans or Phyrexians are victorious in the battle for the plane of Mirrodin. This set will contain 175 cards and the tagline for the set is either "The Sharpest Steel is Tempered in Fire" (Mirrodin Pure) or "The Grand Compleation is Achieved" (New Phyrexia), and the expansion symbol will match the respective Mirran or Phyrexian watermarks found on nearly all non-land cards from Scars of Mirrodin and Mirrodin Besieged. Returning with “Action” are Event Decks. 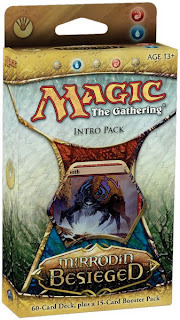 These 60-card decks come with a 15-card sideboard and are intended for use in Standard play tournaments like Friday Night Magic or Game Day. They also come with a Spindown life counter and a reusable card box. 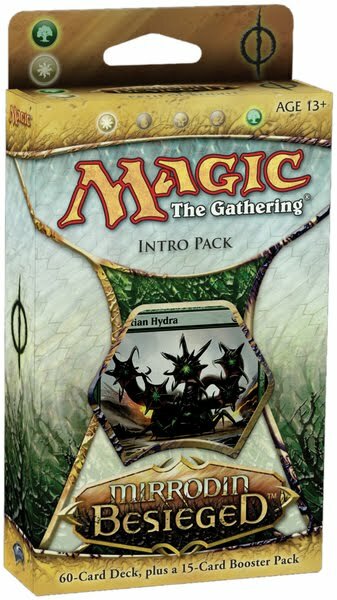 Also, with the release of “Action” Wizards will return to five versions of the Intro Packs as opposed to the four versions in Mirrodin Besieged. Below, is the document from the mothership . . .
Lastly, now is the time to pick up your Mirrodin Besieged Uncommon and Common Deck Set from MTG Mint Card. The clock is ticking away to the Mirrodin Besieged Prerelease which will be held on January 29-30, 2011. This means that time is rapidly diminishing for you (if you have not already) to choose whichc faction to play at your Mirrodin Besieged Prerelease events. This choice will dictate which Faction Packs you will receive for the event. 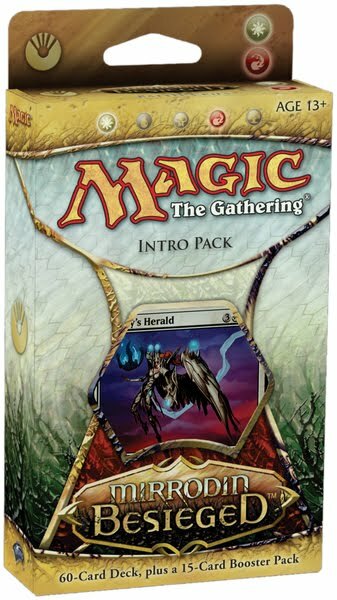 Each of the faction packs contain your usual 15 cards (1 x rare, 3 x uncommons, etc.) dived by faction of course. Premium (foil cards of any rarity are NOT divided by faction) are are randomly inserted (one in every 18 packs?). You are most welcome to switch sides from event to event if your prerelease is running multiple events - one could play a Sealed deck as a Mirran, and then try a Two-Headed Giant event as Phyrexian. Players are of course free to play both Mirran and Phyrexian cards no matter which faction they choose. One thing which may sway your judgement are the two Promo Cards which will be offered . . . While supplies last, players who choose to be Phyrexian in a Prerelease event will receive a Glissa, the Traitor promo and players who choose to be Mirran in a Prerelease event will receive a Hero of Bladehold promo. Also - the buy-a-box promo for Mirrodin Besieged is a very cool Mirran Crusader. Also - a note about trading at the Prerelease Event. Ensure you avoid bad trades - here is a list of some of the more valuable cards in the new set. These prices are in U.S. dollars and are APPROXIMATE - use this guide as a general barometer as to the worth of the card and expect a lot of price fluctuation over the next two to three weeks. Also - we have to call out Wizards on this - we love all the new promo items provided to our local store (At OMG! Games in Barrie, ON., Canada) and this weekend's prerelease promises to be absolutely great - HOWEVER - we're personally not impressed with the Mirran and Phyrexian temp. tattoos - just how old do you think your target market is ? dang. Also - MTG Mint Card has the popular Top 10 Selling Cards from Mirrodin Besieged right before release day . Something very nice was waiting for us when we got home today . . . nope - not leftover pizza - something even better - an envelope from Wizards of the Coast. At first we thought a cease-and-desist letter from their corporate ninjas but our spidery senses informed us something quite different. Very kewl ! Thanks Wizards! MTG Realm may be holding a contest latter for the Mirromancy Intro Pack and as for the rares we pulled out of the two booster packs, we will be sharing them with the local play group down at our store. 3) check out the Wizards Locator to find an event near you. That's it - we hope you have a blast this weekend ! The Mirrodin Besieged Frequently Asked Question (FAQ) document has just been posted. We suggest you give it a review and set to have some fun playing in the pre-release this weekend and the release next weekend. 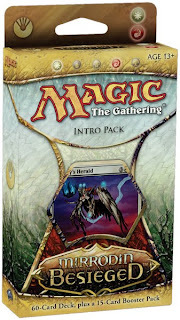 The set contains 155 cards (60 common, 40 uncommon, 35 rare, 10 mythic rare, and 10 basic land). The Mirrodin Besieged set becomes legal for sanctioned Constructed play on its official release date: Friday, 4th 2011. The war rages on. Each Mirrodin Besieged card (except planeswalkers and basic lands) has an identifying insignia in its text box that shows which faction it belongs to. (The Mirran insignia looks like a segmented ring. The Phyrexian insignia looks like a circle with a slash through it.) Faction insignias have no effect on game play. And onto the new keyword techs and other info . . .
Found on Mirran creatures, battle cry is an ability that grants a +1/+0 bonus to other attacking creatures. Living weapon is an ability of Phyrexian Equipment that automatically provides a creature to wield the Equipment when it enters the battlefield. The Mirrodin Besieged set includes a cycle of five Zeniths, powerful spells that can be drawn multiple times over the course of a game. Many abilities and mechanics featured in the Scars of Mirrodin set return in the Mirrodin Besieged set. For more information about infect, -1/-1 counters, poison counters, imprint, metalcraft, and proliferate, check out the previous FAQ document. If you're looking for a great on-line retailer whom you can put in your Mirrodin Besieged pre-orders, give MTG Mint Card a try. You may recall our post way about a month or so ago about the soon to be release Mirrodin Besieged Intro Decks. Well it appears that Trick over at ManaNation now has the full list of contents for us. Some cards are from the most recent core set, Magic 2011, some cards are from the first set in this block, Scars of Mirrodin, and the remainder from this new set. This is a wonderful way for a new player to get into the game. 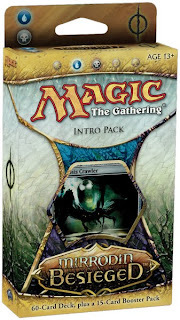 "Battle Cries - / "
"Doom Inevitable - / "
"Path of Blight - / "
Unlike previous sets, Wizards of the Coast will only be providing four versions of the Intro Packs for Mirrodin Besieged (normally, there are five versions) to play. There will be two decks to represent the Mirran faction and two decks for Phyrexia. 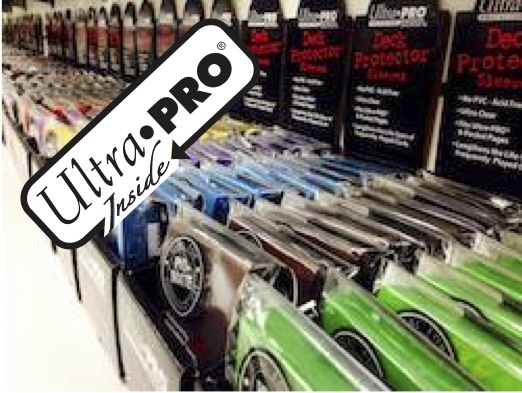 The intro pack displays at your local gaming store will still contain ten decks – two of each type plus two more selected at random. As tradition dictates, Wizards has produced another primer video ahead of the new Magic the Gathering set pre-release. 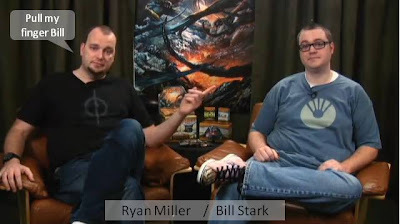 In this their most recent Planeswalker Primer video, WoTC minions Dr. Ryan Miller and Dr. Bill Stark take a look at the overview of Mirrodin Besieged, officially released February 4 and provide tips for the pre-release this weekend. Of note in the video : the Mirrodin Besieged Game Day cards are announced. Game Day events are standard format and held approximately one month after a set's release. Grab a bucket of popped Korn and let's watch . . .
Now a word about the Game Day cards . 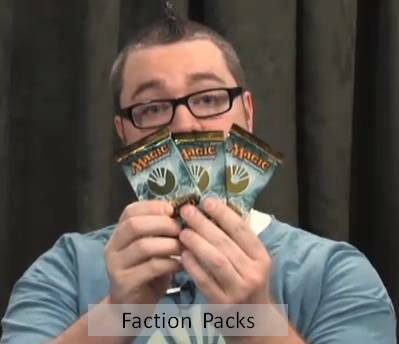 . .
To follow up with the above video, Wizards has provided two additional ones to help you out with the new mechanics. A look at the new 'Battle Cry' mechanic . . .
And here's a look at the new 'Living Weapon' tech . . .
During the pre-release (most places) will provide 3 booster packs of Scars of Mirrodin and 3 booster packs of Mirrodin Besieged. You should be able to get the opportunity to request which faction, Mirran or Phyrexia you want to get for your MBS packs . . . WHICH faction will you go with and WHY ? -> Drop your response in the comment thingy below this post. We are still short a few Magic the Gathering card images but the Mirrodin Besieged spoiler / preview is now complete. Players are itching (not due to abysmal hygiene) to sling this cards during games this weekend at the pre-release. If you are looking for an event, check out the WoTC locator page. You can find the MTG Realm text spoiler HERE, and out MBS Image Garden HERE. Here is the Mirrodin Besieged Checklist - use this very handy form to submit deck lists if required at a future event you attend. The Name and Number Crunch list to summarize the set. Many thanks to Hunter and all the gamers / fans who helped in developing the list.